The early mission of Asset Dedication grew out of a research project at the University of San Francisco’s School of Business in the late 1990’s. Its focus was to engineer retirement income portfolios for individual investors using the liability-driven method of investing that is common within the institutional world. From this research emerged a concept and process for balancing the risks of volatility and longevity through a goals and time-based approach to asset allocation. The cornerstone of this idea is using individual bonds to match a retiree’s income stream. 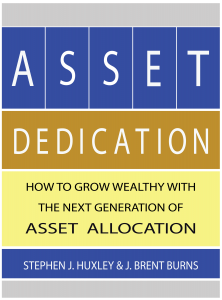 Since 1999, Asset Dedication has evolved into a turnkey asset management platform for financial planners across the country. 1999 – At the University of San Francisco’s School of Business, Stephen J. Huxley and Brent Burns began researching how to engineer retirement income portfolios for individual investors using the liability-driven method of investing. 2002 – Asset Dedication registered as an investment advisor. 2004 – Huxley and Burns co-authored a book entitled Asset Dedication, which described the strategy and was published by McGraw-Hill. 2007 – Established relationships with various custodial firms and began directly managing assets for clients. 2010 – Began offering portfolio solutions to investment advisers via separately managed accounts. 2012 – Started offering turnkey asset management services to financial planners.